President Trump spent his early Wednesday morning, as he does many mornings, on Twitter. This time, he chose to weigh in on the “Criminal Deep State” and the claims that it embedded a spy in his presidential campaign as part of the federal investigation into Russia’s election interference. “They go after Phony Collusion with Russia, a made up Scam, and end up getting caught in a major SPY scandal the likes of which this country may never have seen before!” he wrote. 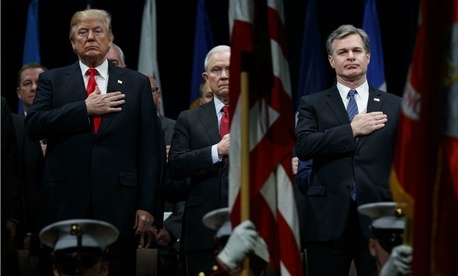 Republicans, touting themselves as the party of law and order, have long aligned themselves with the law-enforcement and intelligence communities. Just before the presidential election, Trump’s newest lawyer and spokesman Rudy Giuliani defended the FBI against criticism about the agency’s handling of an investigation into Hillary Clinton’s private email server. FBI agents “don’t look at it politically,” he said at the time. He frequently touted his ties to the bureau, and claimed to have insider knowledge. In an interview with CNN, in August 2016, Giuliani said FBI agents “talk to me all the time.” In another interview with Fox, days before the election, Giuliani said the FBI agents were “outraged” with Comey’s handling of the Clinton probe. In a radio interview unearthed by The Daily Beast, Giuliani described “a kind of revolution going on inside the FBI” among agents who he claimed disagreed with the decision to clear Clinton of criminal charges. The intelligence community frequently tries to position itself as apolitical, but public opinion of intelligence agencies has in recent decades been clearly divided on partisan lines. Those views have clearly shifted. Gallup polling late last year found that about half of Republicans said the FBI does an excellent or good job, down 13 percentage points since 2014. At the same time, the polling for Democrats who said the FBI does a good or excellent job was up nine points to 69 percent, compared with 60 percent in 2014. “The partisan shift in views suggests Trump’s and other Republicans’ efforts to cast doubt on the FBI’s professionalism and portray it as a partisan agency have been somewhat successful among their supporters,” Gallup’s RJ Reinhart wrote.